A recent Vox eBook examined the potential issues facing various EU members when it comes to negotiating with the UK over Brexit. This column, taken from the ebook, argues that Poland should be in favour of a ‘soft’ Brexit, with the UK retaining access to the Single Market and remaining open to exports from EU countries – including Poland – and contributing to the EU budget. Editor's note: This column first appeared as a chapter in the VoxEU eBook, What To Do With the UK? EU perspectives on Brexit, available to download here. Brexit will affect Poland in many ways, including bilateral trade, foreign investment, movement of people, transfers from the EU budget, and cooperation in security and defence areas. Technical negotiations on the divorce conditions will be conducted by the European Commission within the mandate given by the European Council. This means Poland will have to negotiate on two levels: first, it will try to secure its interests in the process of preparing a common EU negotiating position, which involves negotiations with other EU member states; second, it will have to closely monitor the negotiation process with the UK to ensure that its outcome is acceptable. This requires a thorough assessment of the current links between Poland and the UK in all areas in order to identify strategic Polish interests and risks implied by Brexit. The rest of this chapter is organised in three parts. First, I discuss the status quo in major segments of Poland-UK relations, and identify key exposures. Second, I suggest a possible ‘road map’ for Poland’s position for Brexit negotiations. Third, I present main conclusions and recommendations. While the modalities of the future structure of relations between the EU and the UK are uncertain and will be the outcome of long negotiations between the two parties, Brexit will surely affect all areas of bilateral Poland-UK relations that fall within the competences (exclusive or shared) of the EU. The most relevant ones cover trade in goods and services, foreign investment, movement of people, and payments from the EU budget, as well as some selected issues from the area of common foreign and security policy and the area of common policy of justice and home affairs. The UK is the third largest export market for Poland (after Germany and the Czech Republic), accounting for 6.4% of total exports of goods, and the eighth largest source of Poland’s imports (after Germany, China, Russia, Italy, the Netherlands, France and the Czech Republic), with a share of 2.6% of total imports of goods (see Table 1). The total value of Polish exports to the UK in 2014 was €10,567 million, which is equivalent to some 2.5% of GDP and is almost 2.5 times greater than Polish imports from the UK (at €4,360 million). This large trade surplus makes Poland relatively more dependent on exports to the UK than on imports from the UK. Consequently, Poland is more vulnerable to any restriction on access to the British domestic market after Brexit. By contrast, Poland’s respective share of the UK’s foreign trade is much smaller. Poland is 12th largest exporter to the British market and the 21st largest importer from the UK, with the value of British exports to Poland equivalent to only 0.2% of the UK’s GDP in 2014 (less than a tenth of the respective figure for Poland). This asymmetry in the relative export weights makes Poland’s negotiating position vis-à-vis the UK much weaker. 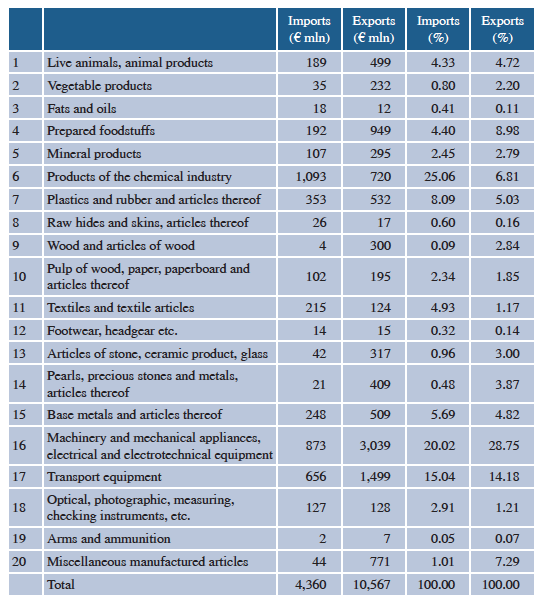 The structure of Polish exports is dominated by machinery, electrical and electronic equipment (accounting for 29% of the total), agricultural products and foodstuffs (16%) and transport equipment (14%) (see Table 2). These three categories, together with chemical products, account for more than two thirds of Polish exports to the UK. Assuming the UK leaves the Single Market (and the customs union) and falls back to WTO rules on trade with the EU, the sectors that are likely to suffer most will be agriculture and – to a lesser extent – car manufacturing, low-processed products such as chemicals, plastic and rubber products, and wood and paper products. On the import side, machinery, electrical and electronic equipment, as well as transport equipment, account for 35% of the total, followed by chemicals (25%). The increase of the import costs after Brexit will likely be rather negligible, and may affect primarily traditionally ‘sensitive’ products such as foodstuffs, textiles and cars. Source: Poland’s Central Statistical Office. The UK is the third largest purchaser of services from Poland (after Germany and Switzerland), accounting for 6.6% of total Polish exports of services, and the second largest exporter of services to Poland (after Germany) with a share of 8.2% of Polish imports. The total value of Polish exports of services to the UK in 2014 was €3.04 billion, almost €1 billion more than the value of imports (at €2.15 billion). In terms of shares of total Polish exports to the UK, telecommunication and informatics services accounted for 23%, professional services for 20%, transport services also for 20%, and other business-oriented services for 10%. On the Polish imports side, ‘other business-oriented services’ accounted for more than half of (mostly accounting and consulting). Somewhat surprisingly, financial services play a relatively minor role in Polish imports from the UK (less than 20%, at under €400 million). Brexit is likely to reduce Polish exports of services in areas such as transport, construction and finance, but since their actual value is relatively small, the overall impact on those sectors in Poland will not be substantial. According to the National Bank of Poland, the value of UK FDI in Poland in 2014 was €5.9 billion, which represented only 3.4% of the total FDI stock (€171.7 billion) registered in the country. Among the largest British investors are Tesco Plc (retail trade), Imperial Tobacco, GlaxoSmithKline (pharmaceuticals), British Oxygen Corporation (industrial gases), Aviva Plc (insurance), Bates Ltd (transport and storage), Cadbury Schweppes (foodstuffs) and Shell Overseas Holdings Ltd. (oil products). A recent trend is to move auxiliary departments of medium and large British firms, such as accounting or HR, to Poland (i.e. offshoring). A considerable part of direct investment goes to real estate. Interestingly, UK financial firms have not invested much in Poland (except for Aviva). Among the 20 largest Polish banks, there is no bank with a dominant share of British capital. Outward FDI by Polish companies in the UK is much smaller in volume, but is growing fast in terms of numbers. According to estimates by the British-Polish Chamber of Commerce, there are already some 40,000 small firms established in the UK by Polish citizens, mostly by those residing in the UK. Brexit is not likely to affect these existing firms, but it could provide incentives to increase the number of investments, both inward and outward, to circumvent potential restrictions imposed on bilateral trade. Large immigration from other EU member states was one of the key factors behind the UK’s decision to leave the EU. It is estimated that there are around 3.6 million EU citizens living in the UK, more than 80% of whom will have permanent residency rights by the time the UK leaves the Union in early 2019. The remainder – more than 600 000 people – will probably be offered an amnesty and the right to stay permanently. Polish citizens represent the largest group among those migrants, totalling some 900,000 (of which some 110,000 were born in the UK). Their resident status will probably be maintained after Brexit, although for some the severance of trade and economic ties between the UK and the EU may provide an impulse to return to Poland. The Polish government will certainly strongly insist on protecting the right of Polish migrants. By contrast, it will not be that much interested in securing further unrestricted access to the British labour market after Brexit, because economic migration from Poland is definitely not a priority. Although the UK is not part of the Schengen area or of the common asylum policies, Poland could count on indirect support from the British for its resistance against expanding EU competences with respect to migration and asylum policies. Both countries (together with some other Central European countries) share a very sceptical view of Wilkommen Politik and strongly resist joint responsibilities and any automatic rules of receiving and reallocating refugees. Brexit will certainly weaken the position of ‘refugee sceptics’ within the EU. In the 2014-2020 Multiannual Financial Framework, Poland is the largest recipient of EU money, both in absolute terms and net of its own contribution. In 2015, it received €13,358 million from the EU budget and paid in €3,718 million, thus benefitting from a net transfer of €9,640 million (or around 2.3% of Polish GDP). The UK is the second largest net payer into the EU budget; its net contribution in 2015 was €10,751 million (after the ‘British rebate’), or 7.4% of the total annual EU budget for that year. Brexit will certainly reduce the EU budget, though probably only after 2018. The impact on Poland’s net position will depend on how successful the Polish government is in safeguarding the current level of transfers. In the most likely case, with the necessary cuts induced by Brexit being spread roughly proportionately across all budgetary lines, the loss will be about 7-8% of the current level. However, if cohesion policies bear the brunt of the expenditure cuts, the net loss for Poland may be substantially larger. If the UK negotiates a ‘Norway-type’ deal with the EU, Poland’s losses will be smaller. The UK has been an important political partner for Poland in the EU. As far as economic policies are concerned, both countries share a similar vision of economic liberalism and free trade, combined with a reluctance to allow Brussels more sway in economic, an especially tax, matters. In the area of foreign and security policy, the UK and Poland have been dedicated supporters of NATO and of close transatlantic ties with the US and Canada. Both countries also have been ready to take a more assertive stance towards Russia, being in favour of reacting more decisively to Russia’s aggressive policies against Ukraine and in the field of energy supplies. With the UK leaving the EU, Poland is likely to lose an important ally in vital areas of common European policies. The relatively high share of the UK in Poland’s exports and the large trade surplus makes Poland relatively more dependent on exports to the UK than on imports from the UK. Consequently, Poland is more vulnerable to any restriction on access to the British domestic market after Brexit. This calls for negotiating for relatively easy access to the UK market for EU exports, which would have to go with full reciprocity. Amongst exports, agriculture, transport equipment and low-processed products should receive special attention in negotiations. If import quotas are negotiated, Poland should secure sufficiently large shares to minimise the impact of Brexit. Concession in other areas may be considered to achieve this goal. Since Brexit is likely to reduce Polish exports of services in areas such as transport, construction and business-oriented services, negotiators should safeguard those exports to the extent possible. But since their actual value is relatively small, the overall impact on those sectors in Poland will not be substantial, and there is no need to offer substantial concession in exchange. No substantial risk seems to exist with respect to FDI. In this area, more is at stake for the UK, so Poland could consider specific concessions in exchange for better market access in other areas. In the area of free movement of people, Poland will concentrate on protecting full resident rights for Polish citizens living in the UK, in particular including unrestricted access to social and public services, and social security guarantees. By contrast, Poland will not insist on maintaining unrestricted access to the British labour market after Btrexit. Brexit will reduce the EU budget, and transfers to Poland will be reduced. This negative impact can be mitigated if the necessary budgetary cuts do not affect cohesion policies (unlikely), or if a ‘Norway-type’ agreement between the EU and the UK is signed, with UK contributions to the EU budget maintained to some extent (again, not very likely). In the area of foreign and security policy, Poland will be interested in cultivating the existing strong ties with the UK. It may propose enhanced cooperation between the EU and the UK to maintain the current balance between diverging priorities within the EU (especially between southern and northern member states) and to better promote its national security interests after Brexit. No one knows what form the divorce contract between the UK and the EU will ultimately take, and the negotiations are likely to last even after early 2019. This allows some time to reflect on the modalities and implications of possible solutions. As of today, taking into account the potential impact of Brexit on trade, investment, movement of people, the EU budget and political cooperation, Poland should be in favour of a rather ‘soft’ Brexit, with the UK retaining access to the Single Market and remaining open to exports from EU countries – including Poland – and contributing to the EU budget.